This means that, to use the stepping sequences as is, the Green and Brown wires are the wrong way round. There is no need to alter the wires at the connector, of course - it can be done in the cable from the PC parallel port or microcontroller. If you have a stepper motor with different wiring, look here. The ULN2003 / MC1413 is a 7-bit 50V 500mA TTL-input NPN darlington driver. This is more than adequate to control a four phase unipolar stepper motor such as the KP4M4-001. I recycled the power and motor lead connectors from the TM100 Logic PCB. A convenient source of 12v and 5v is an old IBM-PC power supply unit. The 9-way D-type connector is appropriate for the number of (parallel) control lines needed in the cable. One of my student groups used an enhanced version of this circuit for their Remote Control WebCam project. One of my individual students produced a microcontroller-driven version for his SMACK project. Read his report for more details. Allegro MicroSystems has a PDF datasheet for its 2003 thru 2024 high-voltage high-current Darlington arrays. Texas Instruments supplies the SN75468, which is a higher-voltage version of the ULN2003A. The ULN2803 is an 8-bit 50V 500mA TTL-input NPN darlington driver. 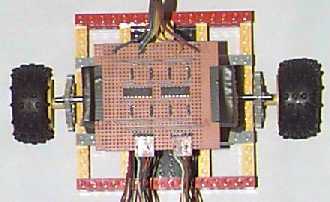 The extra Darlington pair means that two stepper motors can be controlled by this method with the single chip. With the addition of a few resistors, you can control this kind of motor with only two data lines (compared with the Four-Wire Connection, above). This uses the fact that, with Two-Coil Excitation, at any time two of the coils have the inverse excitation (on/off) of the other two. You only need to supply the on/off signals for coils 3 and 2, according to the Two-Coil Excitation sequence. The corresponding inverted signals for coils 1 and 4 are supplied by the circuit itself. I used this circuit (times two) for the StoneAge DiskDrive Logo Turtles and the Pan-and-Tilt Mount for a camera. A disadvantage of this method is that you cannot half-step the motor. Allegro's UCN5804B Stepper-Motor Translator/Driver chip supports all three excitation modes. This translator/driver chip provides complete control and drive for a four-phase unipolar stepper motor. The logic section provides the sequencing logic, DIRECTION and OUTPUT ENABLE control, and a power-on reset function. Three stepper-motor drive formats, wave-drive (one-phase), two-phase, and halfstep are externally selectable. I used the following circuit (times two) for a third (different) controller board for my students. With Pin 15 OUTPUT ENABLE tied to Ground (always enabled), four data lines are required to interface the chip, for all three drive formats to be selectable in software. Bits 1-3 need to be set to 1 or 0 to reflect the desired direction of rotation and drive format. Bit 0 must be set to 1 initially. To step the motor, Bit 0 must be reset to zero for a minimum 3 µsec then set back to 1. Note: If the controller board is powered up but not connected to the PC and under software control, the motor(s) will free run as Pin 11 STEP INPUT floats low. This behaviour can be prevented by connecting a 10K pullup resistor between pin 11 and +5v.